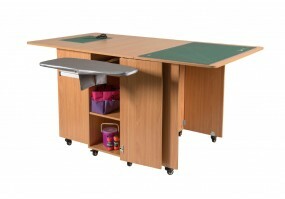 Introducing our newest version of our Craft Plus Table now with Ironing board. The ultimate accessory storage table! Ideal for all your craft and hobby Needs! Folds away for another day!! So convenient and easy to use. No more bending, kneeling, stooping or using the kitchen table. The perfect answer for Craft and Hobby Enthusiasts.